The first Christmas card was created in England in 1843 by Sir Henry Cole. The practice of sending holiday greeting cards goes back to 1843, when an Englishman named Sir Henry Cole, was overwhelmed by having too many friends. 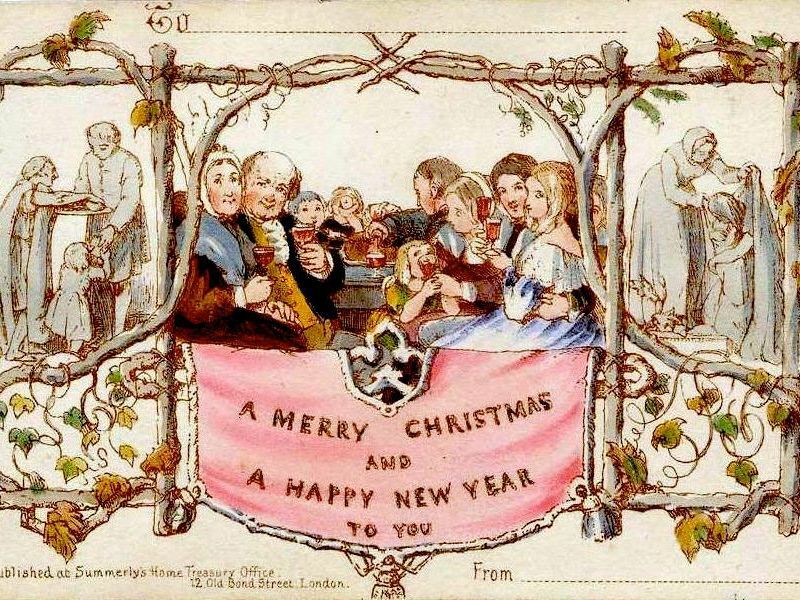 In England at the time, it was traditional to send written Christmas and New Year’s greetings to one’s friends. With a recent upgrade of the English postal system, a letter or card could be mailed anywhere in the country for one cent. The expansion of the railway system, allowed for a quicker and cheaper way to collect and distribute the mail. Cole was a busy man, and didn’t have time to answer all his holiday greetings. It was considered very impolite in Victorian England, not to answer your mail in a timely manner. So, Cole hit upon an ingenious way to respond to the letters. He asked an artist friend, J.C. Horsley, to design a greeting card which would embody the spirit of the holiday. He then had the results printed on 5x3 inch pieces of heavy paper. The greeting card depicted a family around the Christmas table, and included scenes of people helping the poor. The card also included the salutations, “TO” and “FROM”. Seeing that this was a much easier way to send holiday greetings, many of Cole’s friends also began sending cards to their friends. Cole and Horsley saw an opportunity and began selling replicas of their cards for the equivalent of 8 cents. It took several decades for the practice to catch on in England and the United States. The first Christmas card to be printed in the U. S. was created by a Prussian immigrant, Louis Prang, in 1875, who had a print shop in Boston. It consisted of a simple and inexpensive card which depicted a flower with the simple greeting, “Merry Christmas”. These early cards usually highlighted animal, snow or nature scenes and were beautifully colored illustrations. As the practice of sending greeting cards expanded during the late 1800s, card companies offered cash prizes for the best designs from the public. People began collecting Christmas cards, much as stamps and coins are collected today, and the anticipation of getting a newly designed batch of cards each year, became an obsession. Personalized Christmas cards were created and sent in 1891 by Annie Oakley, the famous sharpshooter. She was in Scotland at Christmas time, and had a printer create a card featuring her portrait, which she sent to her friends in the U.S. In 1915, the Hall family of Kansas City, a postcard printing company, decided to get into the Christmas card business. They standardized the size of cards to 4X6 inches, folded once. A decade later, the company changed its name to “Hallmark”. By the 1930s, colorful Christmas cards depicting Santa Clauses, Bethlehem, angels and stars, became the standard.